From the resort’s inception, Steve Wynn vowed it would provide unrivaled service, dining and entertainment — Wynn Las Vegas and its staff deliver on that promise. There are 18 taste-tempting dining venues at the resort. Chef Mark LoRusso brings his masterful seafood techniques to Costa di Mare. The award-winning Wing Lei restaurant offers Chef Ming Yu’s Cantonese, Shanghai and Szechuan dishes. At SW Steakhouse, chef David Walzog works his magic on prime-aged steaks, chops, poultry and seasonal seafood, while chef Enzo Febbraro prepares beloved Italian dishes in Allegro. More casual eating options are available at The Buffet, which features 15 live-action cooking stations, and Red 8, a bistro offering diverse Asian dishes. All of the restaurants at Wynn Las Vegas also boast vegan options. In the Wynn Theater, “Le Rêve – The Dream” entertains audiences nightly. The theater was designed in the round and custom built for the show. The aerial acrobatics and feats of human strength are simply stunning. Along with bars and lounges, Wynn Las Vegas includes the magical multimedia presentations at the Lake of Dreams. At the center of the action, the casino itself features a vibrant atmosphere. There are more than 1,900 slots, a 26-table poker room, an expansive race and sports book with a lounge-like setting and a full slate of tables games — including blackjack, craps, roulette and War. When it comes to relaxing, two main pools, Jacuzzis and private cabanas provide guests with a decadent daytime experience in the sun. The Spa at Wynn Las Vegas — complete with a salon and fitness center — is a sanctuary of care, comfort and beauty. Like the spa, the extravagance of nature and design extends throughout Wynn Las Vegas. Rooms in the high-rise hotel tower are designed to provide views of either the Strip, the resort’s 18-hole golf greens or the waterfall. Natural lighting is prevalent throughout the property. European linens, flat-screen televisions and remote-controlled lighting are among the amenities awaiting guests in these magnificently furnished rooms. The retail experience at Wynn Las Vegas is exceptional as well. Window shopping is a must. You’ll see Brioni, Chanel, Christian Dior, Cartier and Louis Vuitton. Wynn Las Vegas has flawlessly combined the excitement of Las Vegas with leisure. 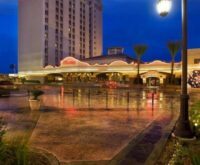 Constantly raising the bar by renovating existing facilities as well as adding new amenities and services to keep ahead of the latest trends, the resort is truly a beacon of modern luxury at the heart of the Strip. Be advised that the main gate is under construction until Fall of 2017. This will not impact the guests room and each guest will be notified upon check-in.